MEATLOAF MEATBALLS TO DIE FOR | Keto One Day At a Time. Best Little Meatloaf Meatballs ever! Preheat oven to 350°. Line cupcake pan with liners or coat with cooking spray. Remove any rings and wash hands well. Stack bread slices and using a sharp knife, dice bread up as if making croutons. Add milk, eggs, seasoning, soy sauce, onion and garlic to bread and mix well. Add ground beef to wet mixture. Using hands, mix well until wet mixture is combined well. Using an ice cream scoop, scoop up a ball of meat mixture. Take one of the bacon halves and wrap around the ball. Place ball into cupcake pan. Mix all ingredients for sauce in a small bowl. Take a spoon of this sauce and spread over the tops of each meatloaf ball. Sprinkle with black pepper. Bake 45 minutes to an hour, depending on oven. After 45 minutes, keep an eye on them to not get over done or they will not be as moist. If you Tried this recipe Please let me know what you thought! I love to get feedback. 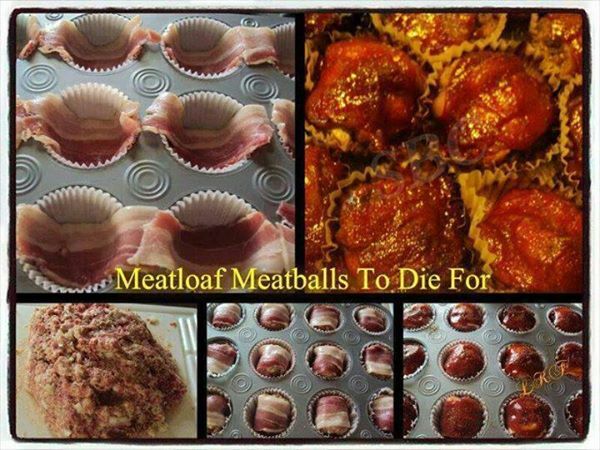 This entry was posted in Easy Recipes and tagged awesome, bacon, bacon recipe, beef, easy, easy recipes, homemade meatloaf, meatloaf, recipes, yummy by NataleeEmbry. Bookmark the permalink.